I went out early today, but the birds must all have been awake long before me and when I left the house the noise in the street was startlingly loud for a Sunday morning. I suppose they were busy discussing air pressure and wind speed, temperature and flight paths or whatever it is that birds talk about before they get moving in the morning. There was so much sound, but no movement and not a single bird to be seen even though the trees are bare of leaves and they must surely have been visible as dark blotches among the branches. 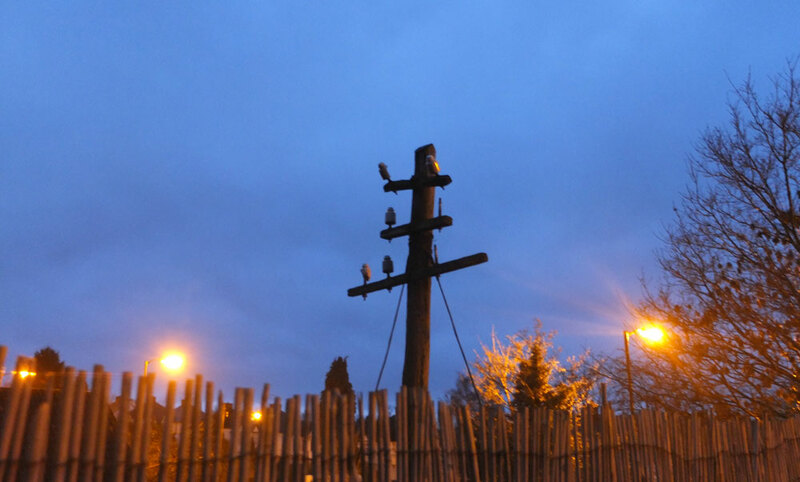 I remember thinking as a child that the insulators on telegraph poles were birds perching; I reckon it was a reasonable mistake. Walking along by the railway line and thinking about telegraph poles brought to mind the scene in E Nesbit’s The Railway Children where the children witness a landslip and need to warn the 11:29 so that there isn’t an accident. “We don’t know how,” said Peter. Of course the girls remember that they are wearing something red and their flannel petticoats are sacrificed for the greater good so there’s a suitably happy ending, both to that incident and to the whole story. I am tempted now to go and read the whole book again. It’s available online at Project Gutenburg: The Railway Children. But they were city children at heart, and there were very few birds in the story, so maybe I’d do better with Frances Hodgson Burnett’s The Secret Garden.